The front pages are a mix - a spate of cash machine thefts, a mother's plea and a Cookstown family's grief. "One month on, our pain feels just as raw," - a father's words headline The Irish News. Lauren Bullock, 17, Morgan Barnard, 17, and 16-year-old Connor Currie died after a crush outside the Greenvale Hotel on St Patrick's Day. Morgan's father James says the family's pain is still the same as the night of the incident. "The raw pain that me and Maria feel is still the raw pain that we are suffering from the first Sunday night," he tells the paper. "We are devastated and missing our son so much and it has left an empty space in our hearts," he adds. The recent spate of cash machine thefts makes the other front pages. In 2019, thieves have struck nine times, stealing 10 individual cash machines. "The £1m crime wave" - The Belfast Telegraph focuses on the money lost. Glyn Roberts from Retail NI warns that not only are business facing repair costs but lost trade and hikes in insurance. 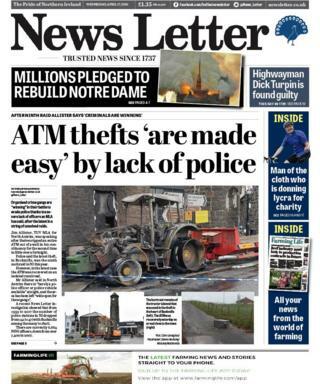 "ATM thefts are made easy by lack of police," headlines The News Letter. TUV MLA Jim Allister says the rural location for the thefts is a factor. "In north Antrim there is barely a police officer or police vehicle available at night". He says as a result the area has been left "wide open" for these gangs to carry out thefts. 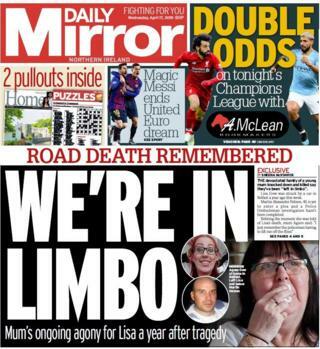 "We're in limbo" -The Daily Mirror headlines with a mother's agony. Mother-of-two Lisa Gow died after being hit by a car on the Ballysillan Road in April 2018. The family tells the paper that one year on, questions as to why Ms Gow was on the part of the road where she was killed, "haunt" them. "We still don't know what she was doing up that way. We don't know and we'll never know," her mother Agnes says. Delving into the papers, there is an appeal to solve the "mystery" of a missing artefact from a Belfast church in The Irish News. St Patrick's Church in Donegall Street was home to a 10ft (3m) altar which was donated to the church in 1919. However parts of it have not been seen for 40 years. Fr Eugene O'Neill tell the paper the altar, which was adorned with a painting, was a gift from artist John Lavery who was baptised there. After a fire in 1977 the altar's location has mystery, he tells the paper. Fr O'Neill would like the altar and candle sticks to be restored to their home and is appealing for information. "This church is the possession of all the people of Belfast. "They would have something returned to them by one of the greatest artists of the 20th Century," he adds. Whether she's a Massey, John Deere, New Holland or Ford - every culchie in Northern Ireland has a favourite tractor. One family is celebrating their tractor's 50th birthday, we hear in the Belfast Telegraph. Half a century ago Ben McFarland from Moy, who turns 93 next month, bought a David Brown Selectamatic 880 machine. Mr McFarland's son Eric remembers the "day she came home" and became part of the family. He says that in 50 years hardly a day has gone by when she hasn't gone to work. Four generations of the family have sat in the driving seat. Son Gary, who is now 35, took over and learnt to drive it when he was nine. Eric's grandson Lewis, 7, will be the next McFarland man to take a seat. His wife says he has been with the tractor longer than her. "I've been in the family 43 years but that wee tractor beats me by a few. "Eric's as proud as punch at the way she has lasted", says Margaret.